The Cape Times; The Argus; Weekend Argus; Die Burger; Beeld; Big Issue; Mango; City Views; Atlantic Sun; Tatler; City Views; Fresh Living; Moneyweb; Business Day; Mail & Guardian; iol.co.za; Mahala; SABC 50/50vimeo.com/39885478; Cape TV; CNN; Huffington Post; Global Dialogue Centre; Water Research Commission: The Water Wheel; SA Water & Energy Forum; TEDx Cape Town; Earthworks Magazine; Cape Talk Radio; SAFM; Voice of the Cape; 567 CapeTalk; African Centre for Cities. RECLAIM CAMISSA has participated in the Architecture ZA; The ChinAfrica Forum; Goedgedact Forum and Infecting the City; and is included in the books: "100 GOOD IDEAS: Celebrating 20 Years of Democracy", published by Bell-Roberts, 2013; "Counter Currents: Experiments in Sustainability in the Cape Town Region", edited by Prof. Edgar Pieterse, 2010; and Organising Local Economic Development: The role of Development Agencies and Companies", by Greg Clark, Joe Huxley, Debra Mountford, OECD, 2010. CNN's Eroll Barnett, "Inside Africa" correspondent - exploring the tunnels of CAMISSA, February 2012. CoCT 2010 FIFA WORLD CUP Feasibility Study: The Supply of Irrigation Water to Green Point Common, Reference No: R030800196, Preliminary Investigation Report, Issue 1, J27353, May 2008. Mountain water for Green Point Common: 'Free-flowing streams can become useful', Lynette Johns - Cape Argus, 13 September 2008. Cape Town Central City: Into the Future, Central City Development Strategy - 2009. Scientists seek to reconnect city with Table Mountain springs, by Caitlin Ross - The Big Issue, September - October, 2009. Cape Town's Water springs to life, by Louise Tudor-Jones, 2009. Water, by Barbara Toressi, 2009. Green Goal Progress Report, 2010 FIFA WORLD CUP, September 2009. Tapping into the 'sweet waters' of the Cape, by Murray Williams - Cape Times, 2009. Bid to tap city's 'sweet waters': Old springs could supply new wealth, by Murray Williams - Cape Argus, 3 November 2009. Big ideas for city's water sources, by Ella Smook, 2009. Tunnels 'waste city's buried treasure', by Ella Smook - Argus, 2009. 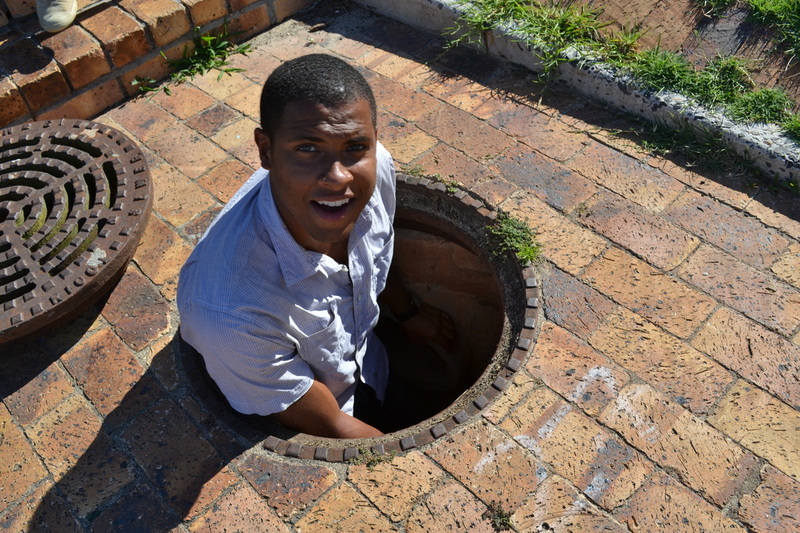 City bid to reclaim water lost to sea: A mole-like tour in stormwater tunnels under the streets reveals future possibilities, by Ella Smook - Weekend Argus, 21 November 2009. Cape Town Partnership: Annual Report, 2009. Water Strategy: Proposal to make city 'Venice of Africa', by Syma Mohammed - Cape Times, 1 July 2010. Reclaiming the city's 'sweet waters', by Karen Watkins - Atlantic Sun, 8 July 2010. Reclaiming the city's 'sweet waters', by Karen Watkins - Tatler, 29 July 2010. We all have a role to play in making city more sustainable, by Rory Williams - "Men about Town" Cape Times, August 2010. How we're reimagining Cape Town: The city centre has made huge strides, but its greatest years are yet to come, by Andrew Boraine - Cape Argus, 5 July 2010. Transformation by urban design: Making the city a better place to live in is key to Cape Town's bid to be World Design Capital 2014, by Lorelle Bell - Cape Argus, 1 September 2010. Cape Town: God is Water, by Valerie Tarico - Huffington Post, 6 September 2010. Against the Tide, by Kim Cloete - Moneyweb, December 2010. "Counter Currents: Experiments in Sustainability in the Cape Town Region", edited by Prof. Edgar Pieterse, 2010. Organising Local Economic Development: The role of Development Agencies and Companies", by Greg Clark, Joe Huxley, Debra Mountford, OECD, 2010. 2010 FIFA WORLD CUP: Green Goal Legacy Report, 2010. 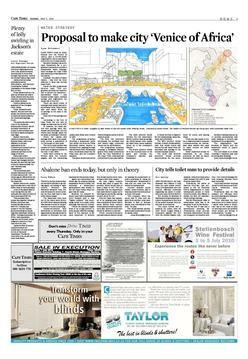 Visions of city's future, from kids to designers, Michelle Jones - Cape Times, 13 December 2010. WATER : Reclaim Camissa Project - Smart Living Handbook, 2010. Cape Town: Water for a thirsty city (Part 1), by Petro Kotzé - Water Research Commission: Water Wheel, Oct-Nov 2010. Cape Town: Water for a thirsty city (Part 2), by Petro Kotzé - Water Research Commission: Water Wheel, Jan 2011. Treasure hunt in the hood, by Zane Henry - iol.co.za, 15 February 2011. A free treasure trove of art in all its forms, Art Writer - Cape Times, 22 February 2011. Start in the Sewer, by Leila Bloch and Rob Scher - Mahala, February 2011. 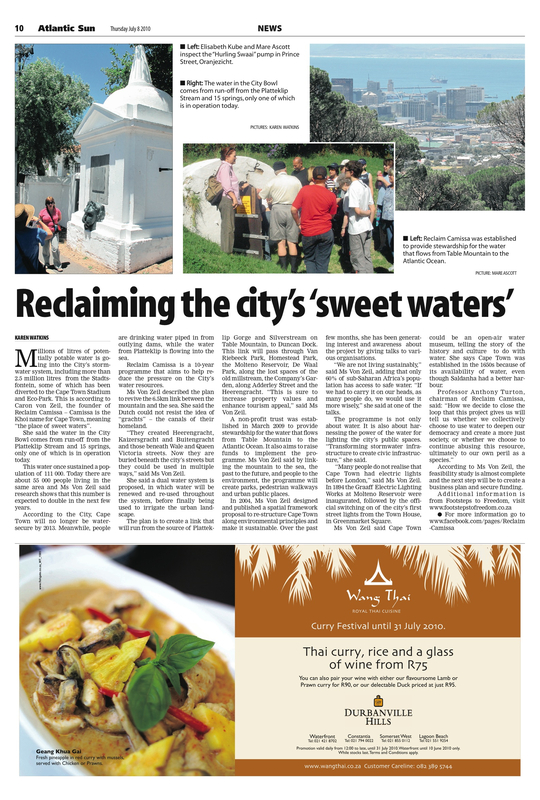 Old water courses could point the way forward for city, by Rory Williams - "Men about Town" Cape Times, 6 June 2011. In die maag van die Moeder(stad), by Le Roux Schoeman - BY, 26 February 2011. Cape Town's World Design Capital, 2014 - Bid Book, 2011. The big picture is made up of lots of smaller projects, by Rory Williams - "Men about Town" Cape Times, 7 November 2011. CAMISSA - 'the place of sweet waters' - South African Water & Energy Forum, 2012. Unearthing the secrets of Table Mountain, by Errol Barnett - CNN, 6 February 2012. Living in the shadows of Cape Town's Table Mountain, by Eroll Barnett - CNN, 6 February 2012. Underground Labyrinth, by Lene Tempelhoff - Cape Times, 1 June 2012. Cape Town's pioneeering use of renewable energy commemorated at Green Point Common, by Dave Crombie - Atlantic Sun, 2012. Cape Town – the place of sweet waters, Cape Town Tourism Blog, 2012. Urban Water - Back to Source, by Carole Knight- Earthworks Magazine, Issue 13, March-April 2013. Tunnel vision in Cape Town, by Brent Meersman - Mail & Guardian, 26 April 2013. If labour broking goes, so do jobs, by David Gleason - Business Day Live, 12 June 2013. RIVER FEEDS INTO SEWERS: City's spring water wasted, by Melanie Gosling - Cape Times, 14 June 2013. A farm - and a sense of pride flourishes again in city's heart, by Sheryl Ozinsky, Mario Graziani, Kurt Ackermann, Tanya de Villiers and Mark Stead - Cape Times, 20 June 2013. City stance on wetland park defended, by Environment Writer - Cape Times, 24 June 2013. Letter to the Editor: "Probe needed into permission for Oranjezicht City Farm", by RECLAIM CAMISSA - Cape Times, 24 June 2013. Letter to the Editor: "Spring exploited" by Patric Tariq Mellet - Cape Times, 24 June 2013. Letter to the Editor: "Camissa's solution" by Chris Jansen - Cape Times, 24 June 2013. Letter to the Editor: "Priorities skewed" by Councillor Yagyah Adams (Cape Muslim Congress) - Cape Times, 25 June 2013. Letter to the Editor: "City's bowl" by Colleen Stolzman and Janet Manca - Cape Times, 26 June 2013. Water wall, by Karen Kotze - Tatler, 27 June 2013. 100 GOOD IDEAS: Celebrating 20 Years of Democracy, published by Bell-Roberts, 2013.